There are times when life gets really tough and putting one foot in front of the other is all you can do. Perhaps you are going through a relationship difficulty and it’s making life more than hard. Maybe you’re in the middle of unemployment and have more month than money. Or perhaps personal or family health problems are causing major distress. Whatever it is, today I simply want to encourage you to keep going. God sees and knows! He has not promised us that we will not have trouble in this world; but he has told us to take heart; he has overcome the world. He will not leave you and is with you every step of the way. 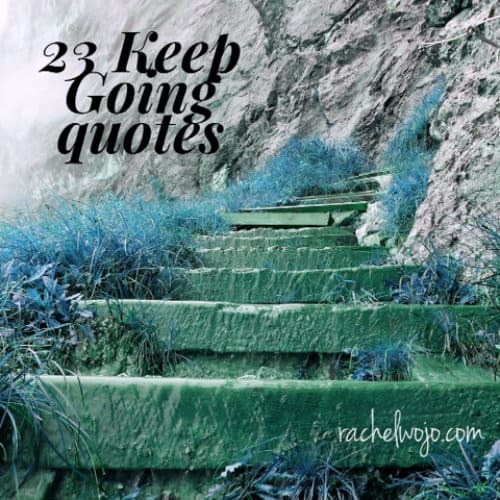 Today I wanted to share 23 keep going quotes. For those times you need to hold on to a few words as a reminder that you will get through this in Jesus’ strength. Be sure to check out these 12 Bible verses for when you feel like giving up! Thanks for those great quotes. I printed them out so I can use them to encourage my teenage daughter whenever she needs it. God has you Jazmin!! My heart breaks for you; He has not forgotten you. He is right there with you. Jesus, please give Jazmin a sense of your presence in her life right now. That she would know the peace that only comes from you! When I read your reply to the post, I gulped and feel an ache in my heart for you! I don’t know where you live, it doesn’t matter, I am praying for Gods’ perfect provision to come to you in ‘and suddenly’!!! Provision for help with care giving, provision for encouragment and in every area. Woke up with John 14:12 and realise I need that faith to be able to do christian deeds to others and work for his kingdom. But I tell I CNT wake CNT think of anything I feel I’m becoming depressed and soaring in body mass. Hugs and prayers for you, dear Gift!! God is with you! Oh Rachel, it’s like you handed me a big glass of refreshing water for my parched soul. You are such a blessing! I just love your blog & on days like today where 1 step forward seems just too big to take, you give me the encouragement I need to take it & maybe even another step 🙂 God is doing wonderful things through you! Oh girl!! Baby steps. Some of my steps go sideways and it feels like I made zero progress. But all steps are progress because they are building strength! Thank you so much for the encouragement this morning! Yesterday I had so much gusto and optimism for the week and today is just feeling like a struggle. Thank you for all these quotes, it’s helping to bolster me a little. I just found you and signed up for your email list last week… Last night, I wrote in my prayer book that I was thinking of giving up on something. I asked God for a sign that I was on the right path. Then this morning, I saw I had an unread email with the link for this post in it. Chills, tears and smiles. He always knows what we need. are you spying on me?! I needed this today! Thank you so much Rachel!! This couldn’t come at a better time. My divorce was just finalized a month ago. I have two young boys, 10 and 7, breast cancer diagnosis and having surgery tomorrow morning. I was crying and managed to smile all while reading. I will take this with me tomorrow and keep it close to my heart, or if I ever need it again. Thank you for bringing light to the world everyday. oh Juliet! Jesus, please be with Juliet today and especially tomorrow morning as she faces this surgery. Give her the peace that can only come from you and is bigger than all our minds can fathom. I just put a reminder in my phone to pray for you tomorrow morning, Juliet! This life is filled with negativity such as disappointment, rejection, failure, abuse, you name it. In this case, discouragement is inevitable. The bottom line is that things will not always go well as planned. But, what will make the difference is how we react to such problem. As weak we are as human being, we have a tendency to allow life crushing circumstances to completely carry us away as though there is more more hope. In other words, it’s not worth it to keep pressing on. The good news is that as God’s children whom He deeply loves and cares about we can turn to His Word for guidance and sustenance in tough times. The Word is like pumping more fuel into our gas tank when we’re running low. It’s what energizes to continue to persevere no matter how dreadful it looks.